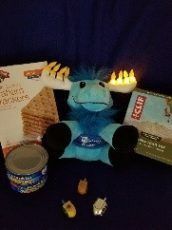 Max the Mitzvah Moose loves celebrating Hanukkah – lighting candles, playing dreidel, eating latkes...and especially spreading kindness! This season of light is a season of giving. Lighting candles and giving to others are both things that we can do that spread light and warmth. 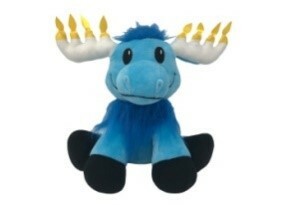 Let’s celebrate Hanukkah by sharing light and warmth, and spreading kindness. 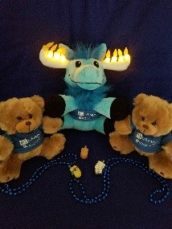 Here’s how – Max the Mitzvah Moose has special kindness projects that you and your family can do for each of the eight days of Hanukkah. Have fun doing these projects together and spreading kindness! Kids love to play! 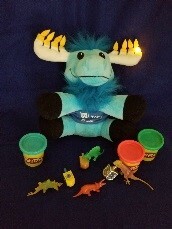 Shop for a toy or game that seems like a lot of fun to you, then share it with another child by delivering it to an organization that is collecting toys to give out to other kids. Friends love to visit each other for holidays. Make a new friend today by getting in touch with a nursing home or assisted living center to see who there might like a visit. Create some beautiful artwork to take with you to decorate your new friend’s room. This could be the start of a beautiful friendship! Every community is supported by an amazing group of helpers – police officers, firefighters, paramedics – who do their job day in and day out with no expectation of thanks. Today is a good day to do some baking and decorate some thank you cards to deliver to the helpers in our community. What are your favorite things to eat? Do you like to share snacks with friends? Go to a grocery store and pick out some of your favorite food items, then bring those to a food pantry so they can be shared throughout our community. Surprise people today with unexpected, thoughtful acts. Hold doors. Smile at people. Pay for someone’s coffee. Help a friend pick up. Let someone go ahead of you. Watch for opportunities to be kind and helpful. Enjoy the feeling of spreading sunshine! When it gets cold there is nothing better than snuggling up in some cozy pajamas at night! Shop for the snuggliest jammies you can find and then help them find their way to kids who enjoy being cozy as much as you do! Some of us love animals – and our animal friends like to feel that love too! Help out some animal friends by picking out some gifts to give to an animal shelter. You can help feathered friends this winter by making a bird feeder and keeping it full of food. We all have special people in our lives – people who make a big difference to us by offering a helping hand, a hug, a listening ear, or a little encouragement when we need it. Think about the special people in your life -- parents, grandparents, friends, neighbors, teachers and coaches, and write some 'thank you' notes to let them know how much they mean to you. There are many local organizations that can benefit from your kindness. Suggestions given here are meant to be helpful rather than exhaustive – please give where you see fit.